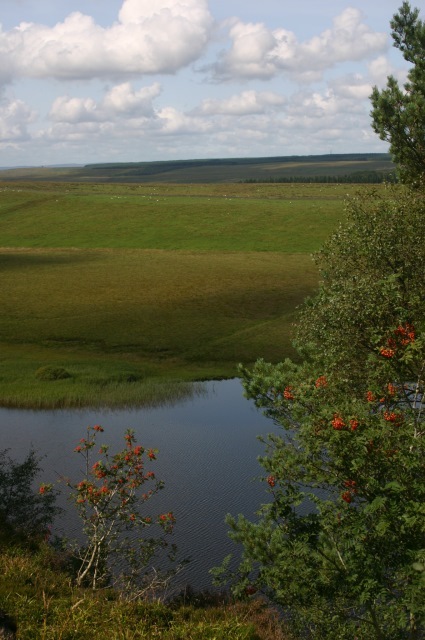 The Roman Empire's British frontier still runs across northern England. 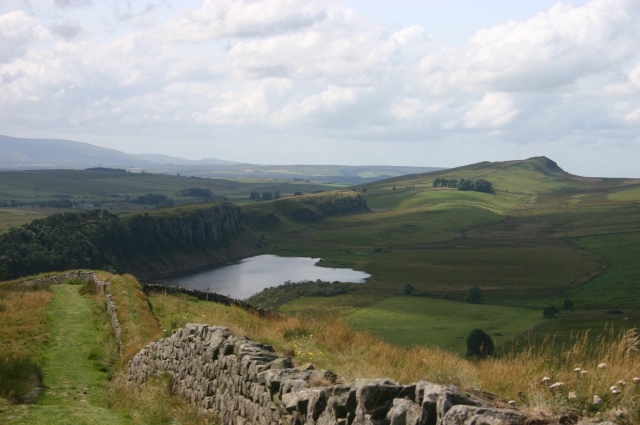 Follow the Wall as it snakes through superb hill and moorland scenery. Historically enthralling: with well preserved stretches of wall, towers, forts and camps, you can almost hear the legionaries tramping along the wall. One of Walkopedia's favourite walks. While crowding in places will detract form the full magic, you can screen quite a bit of it out. Hadrian’s wall is so exciting that tt is hard to sort the gush of information and images that wells up when you try to explain its fascination. It is one of Walkopedia's highest-ranking walks. Where to start? 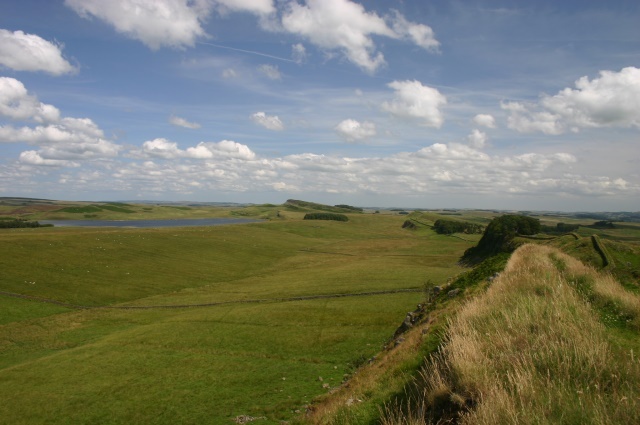 The Roman Empire’s British frontier still runs from sea to sea across northern England, through magnificent hill and moorland scenery for much of the way. With many stretches in remarkable condition, this combination of beauty and extreme history makes for thrilling, inspirational walking. Roman Britain's northern borders had long been troublesome, with constant low-level fighting with the barbarian Picts to the north. 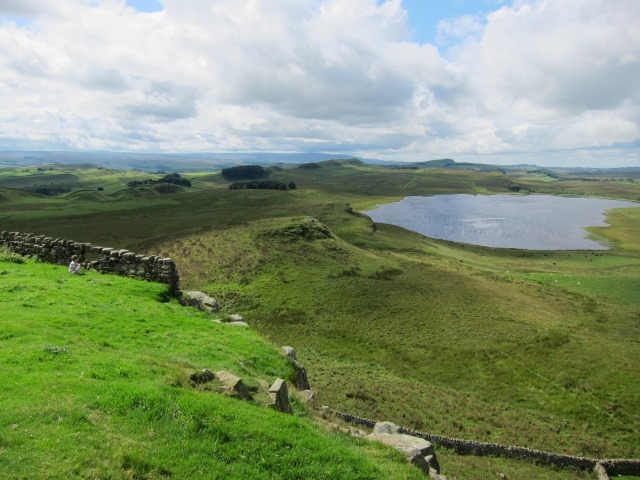 By 122AD, the sprawling empire was close to overstretch and the emperor Hadrian decided to withdraw from the Antonine Wall in the Scottish lowlands, building a strong permanent frontier along the hills and crags to the north of the Tyne valley with a purpose of controlling trade as well as defence. The wall ran for some 122 km (76 miles) between what are now Newcastle and the Solway Firth, the majority of it built of stone and some four metres (14 feet) high, with deep vallums (ditches) on each side. The wall was brilliantly sited, following high ground wherever practicable, its central sections snaking along a series of ridges known as Whin Sill, a hard dolerite sheet pushed up through the area's predominant limestone which breaks up into cliffs and tough slopes to the north. 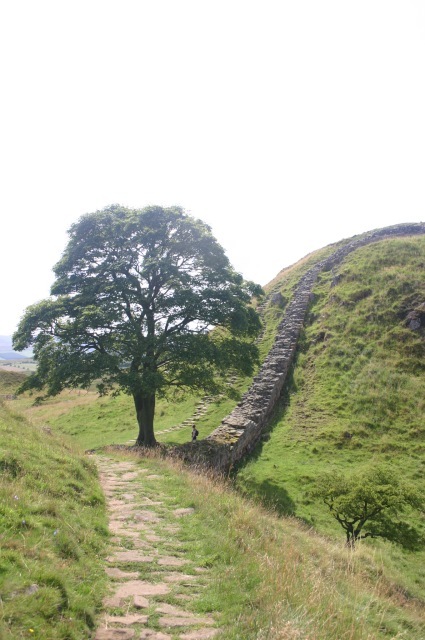 Mile castles and regular forts, such as Housteads and Chesters, sat along the wall. 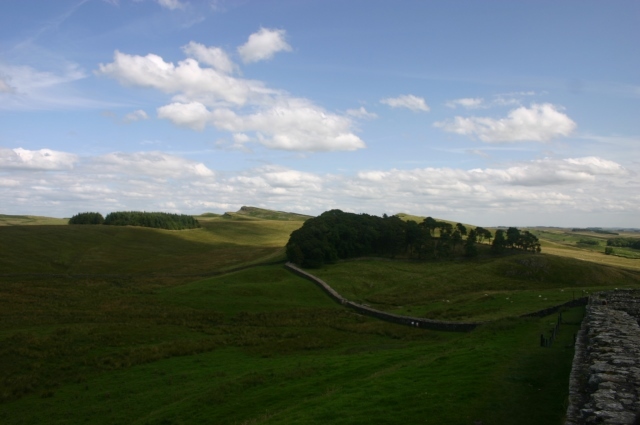 Big camps such as Vindolanda lay a few miles behind, from which reinforcements could deploy to troublespots. Hadrian was quite a man, one of the “Five Good” Nerva-Antonine emperors, the dynasty during which the empire reached its zenith. He spent much of his reign (117-138 AD) travelling his empire inspecting legions and dispositions, and was frequently on its vulerable northern and eastern borders. His reign was, however, a time of peace and stability. Hadrian was a highly-educated man of wide knowledge and culture, and a Hellenophile. While his most famous monument is the eponymous British wall, he was a great builder, the present form of the magnificent Parthenon in Rome being another of his creations, as was his still-beautiful villa at Tivoli. He was also a poet in both Latin and Greek. It is said that he never got over the drowning, in 130 AD, of his more-than-close companion, the Asian-Greek Antinous. Following its abandonment in the early 400s as the empire disintegrated, the wall fell into obscurity in lawless country, witness to raiding parties and cattle rustlers driving their booty through its crumbling gateways. It survived surprisingly well for some 700 years after its abandonment, but was pillaged for building materials in the Middle Ages. It is as a result now in very mixed condition; the local antiquarian John Claydon effectively saving much of what is now left in the19th Century. Some stretches, for instance from Housteads to Steel Rigg, are in fantastic condition (actually, restored by Claydon) and are deeply evocative. 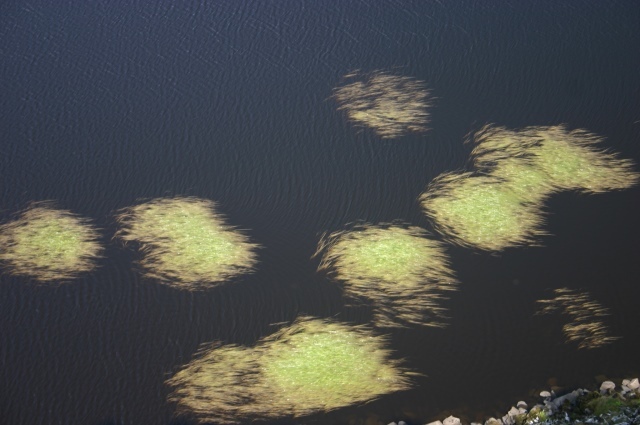 Much of the wall is, however, almost invisible, although even then it a stern presence. A central section became a World Heritage Site in 1987. History is enthrallingly immediate here. 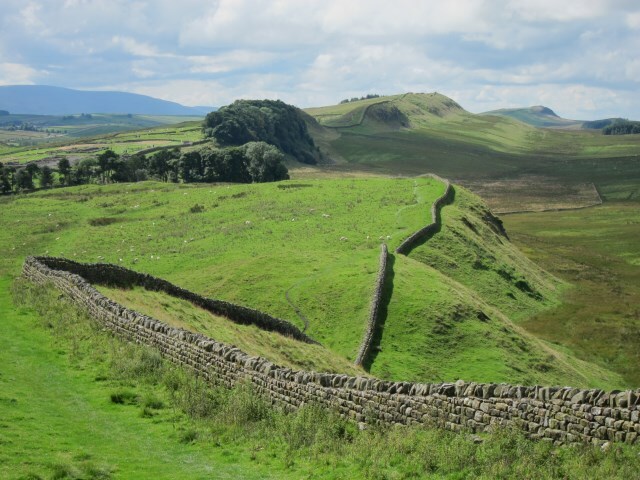 There is an intense connectedness about striding along the wall, overlooking the rough lands to the north: you can almost hear the legionaries tramping along the central stretches, and feel the loneliness of a watchman gazing northward to the empty Pictish wastes. 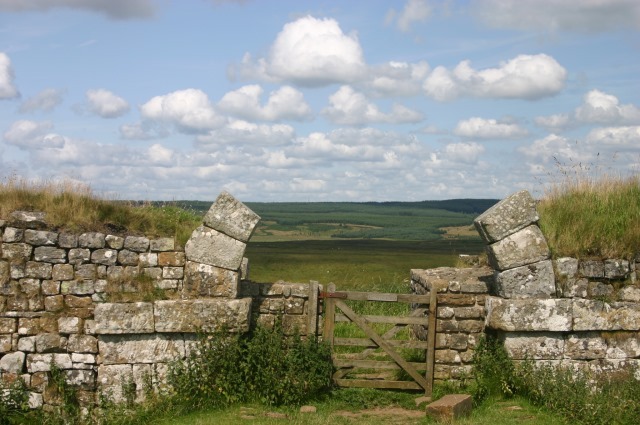 The wall meanders through often captivating countryside: wide views out from abrupt cliff-faces command the high farmland, moors and small lakes to the north and survey the Tyne valley and the Pennine hills to the south. While sheep farming and some natural and often boggy wasteland predominate in the upland areas, the path runs through arable land in the eastern and western sections. A joy of walking the Wall is the profusion of good places to stay, from pubs and BnBs to comfy hotels, and you can have your luggage taken from place to place, leaving you with just a day pack and your excitement. Most people come by car to the their chosen start/end points. The brilliant AD122 Hadrian's Wall Bus (between Easter and October) stops at many points along the wall and opens up all sorts of possibilities of being taken back to your car at the end (or vice versa). 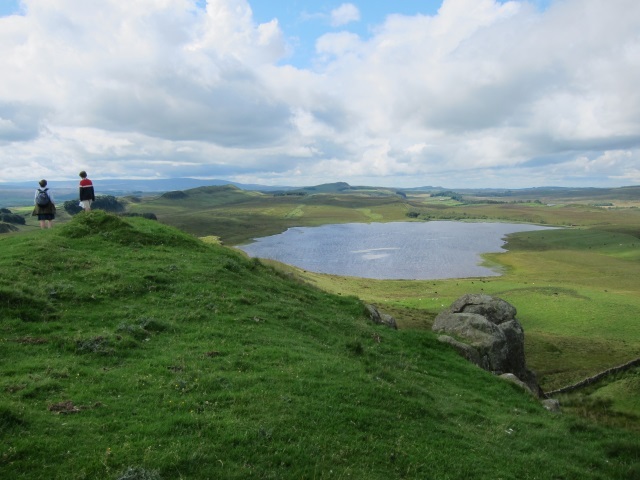 While many people walk the whole 85 miles of the Hadrian's Wall Path, most select a few central sections. Key sites on the most popular stretches can get crowded and much of the eastern wall is close to a main road, which dissipate some of the magic, although you can screen out much of the intruding modernity. The path can descend into tediously deep mud in some sections, requiring evasive action. The most dramatic wallscape, in the most improbable and gorgeous countryside, is between Chesters fort and Gisland, the great majority of it in the Northumberland National Park. It is one of the most enjoyable walks Walkopedia has ever made. While its scenery may not match the Himalayan, and it was a bit overpopulated the times we were there, it was captivating nevertheless: gorgeous, wide views out from abrupt cliff-faces over the high farmland, moors and small lakes to the north and across the Tyne valley to the Pennine hills to the south; and an area redolent of extreme history. 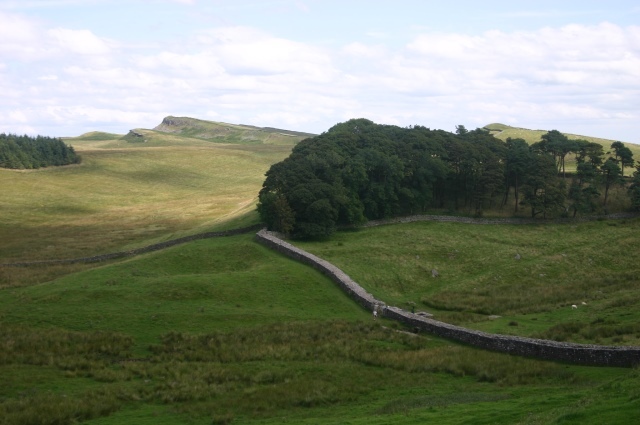 If you can only walk one section it would have to be from Sewing Shields, near where the wall leaves its parallel route with the main road, westward via famous Housteads fort and the famous high central crags, to the road junction at Steel Rigg. 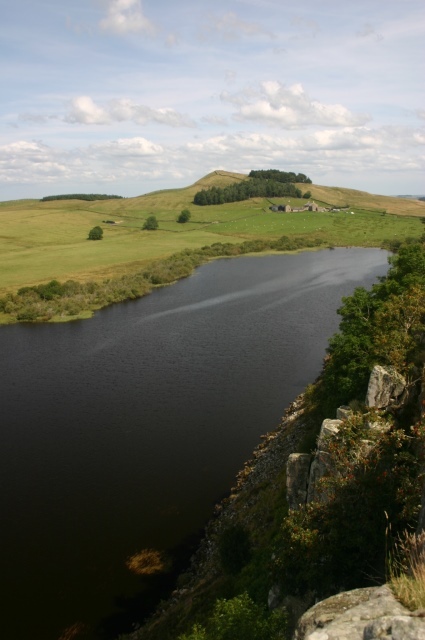 Marching along the Whin Sill ridges, the wall offers huge views, often peering down over cliffs and tough slopes into the reedy and ravishing lochs to the north, and you can see why the defensive line was sited here, north of the gentler banks of the Tyne. 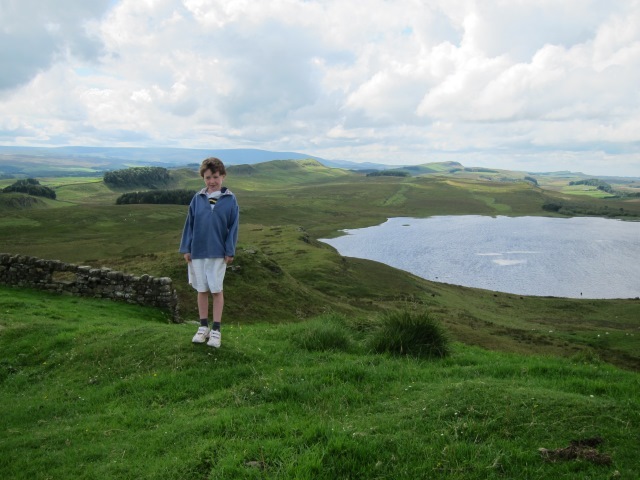 This is a very concentrated 5 miles or so – a bit over two hours – of inspirational walking. 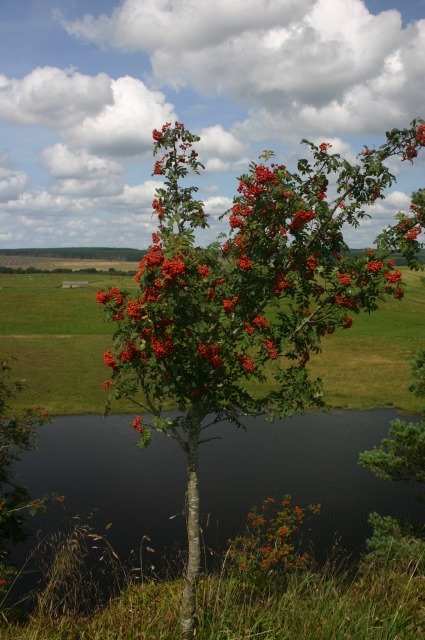 After the wettest UK July in more than 100 years, I couldn't believe my luck: a clear sky was peppered with puffy little clouds, heat tempered by a gentle breeze. Perfect walking conditions. 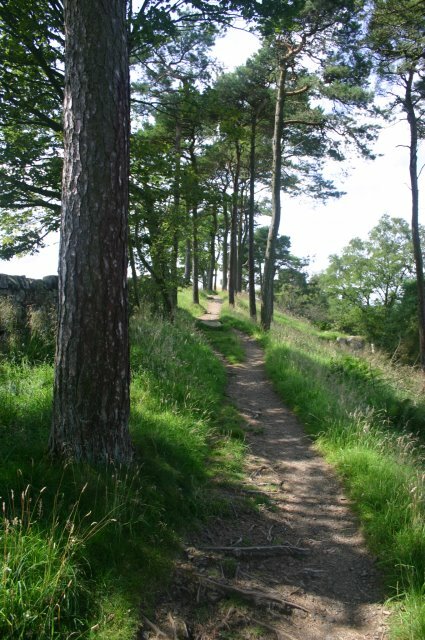 My wife and I walked Hadrian's Wall Path from sea to sea, actually extending our walk to Tynemouth, England this past June (2010). This was the first recreational walk we have done, and we really enjoyed the week. 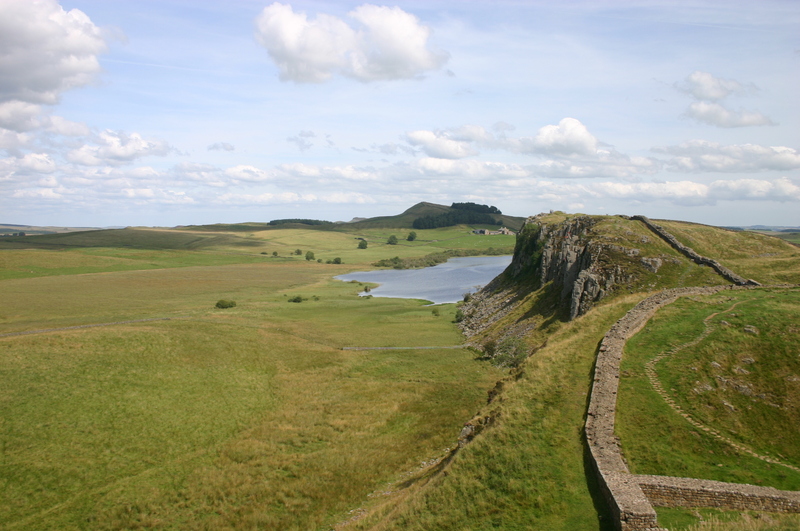 We are now looking for another weeklong trip and hope it will be as fulfilling as Hadrian's Wall. 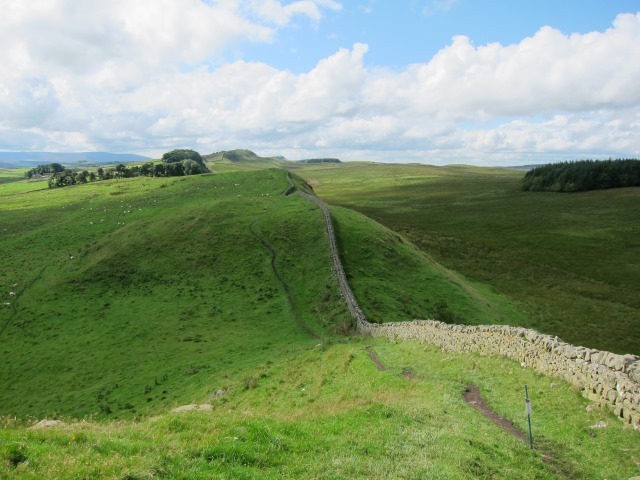 We walked from west to east, which most Hadrian's Wall walkers do not do. This direction kept the wind to our back most of the time, which was very nice. It did not rain and it was very warm during our week walking, which is unusual for northern England. A cold, wet rain blowing hard could have been very possible, and most unpleasant, if we had been walking east to west. Why 75% of folks walk east to west is still a mystery to us. (The Romans did build the wall east to west, but that was over 1900 years ago so this should not influence today's walkers, in my opinion.) 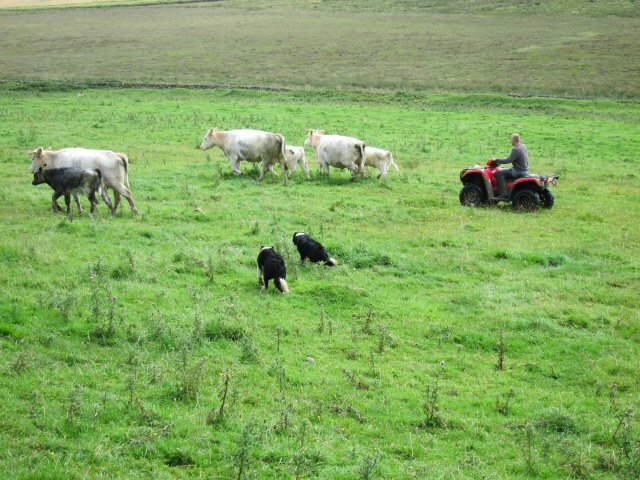 This walk is mainly through farm fields and pastures, so walkers need to be ready to be fairly close to sheep and cows. These animals are supposed to be very neighborly except during calving time and except for bulls, and we had no issues with the local animals. Tour operators will convey your baggage from B & B to B & B, which was very nice. We are middle aged and not having to haul backpacks allowed us to make this fairly arduous walk. Also, a lot of the B & B's have restaurants associated with them, and cook in the New British cooking style. Their cuisine is fantastic in many cases, and much better than the cooking we knew from England of 20 years ago. The nine crags which are on this walk are steep so I strongly recommend using hiking poles. 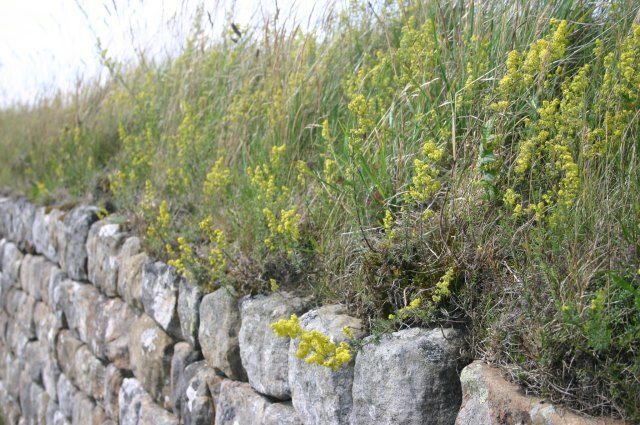 (The Romans used the steep crags as part of the wall's defensive strategy.) Poles make upward climbs easier, and add balance for the equally steep downhill portions. We did not encounter any rain to speak of, but climbing up and down wet hillsides without poles would have certainly been riskier and less enjoyable. 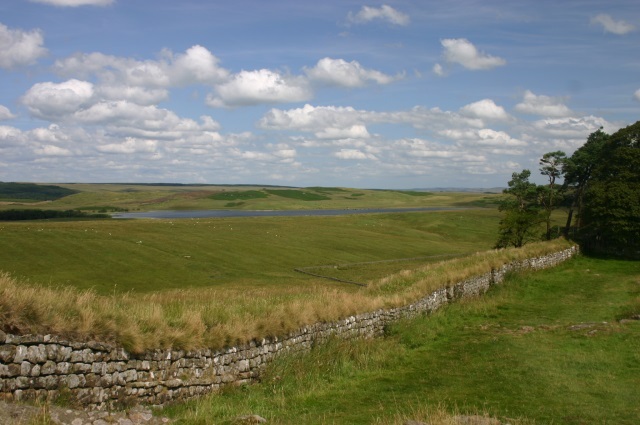 I highly recommend Hadrian's Wall Path to folks who would like to see the countryside and historical past of friendly northern England. So far as the route goes, the western end from Bowness to Carlisle is for completists only, I could see no sign of the Wall and little of interest. From Carlisle to Walton things cheer up a bit, but you aren't missing much. After that (walking west to east) things improve rapidly. The moment of truth dawned, we stood outside Newcastle Station, looked at each other and smiled, both thinking exactly the same thing- we must be mad. The sky was leaden, a light drizzle was falling and an icy wind whipped round our ears as we shouldered our backpacks and started to walk to the Solway Firth. We had a guidebook, a map, a list of possible accommodation and a lot of trepidation. We had to laugh when two fishermen smiled at us, looked at our backpacks and asked in broad Geordie accents ‘if we were going all the way’. Needless to say we smiled, hitched up our packs and replied, ’of course’ I have to admit that put a new spring in our step. It seemed to be easy walking, soon we had left the city behind us. 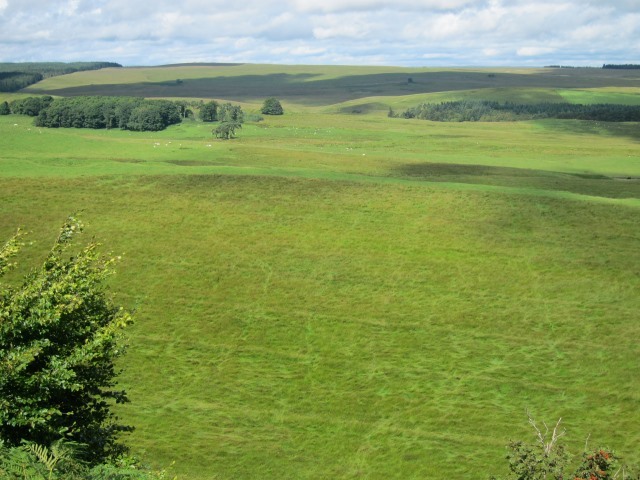 After a while we began to loose the lush green fields and began to steadily climb. I was finding this particularly hard work, as I was not particularly fit, soon my legs began to feel leaden and I was struggling for breath. I sat down on a rock feeling that my end had come and quite ashamed that I hadn’t managed to complete one day. Fortunately after a brief respite and some chocolate therapy I recovered and reached the top of the hill where a spectacular view awaited. 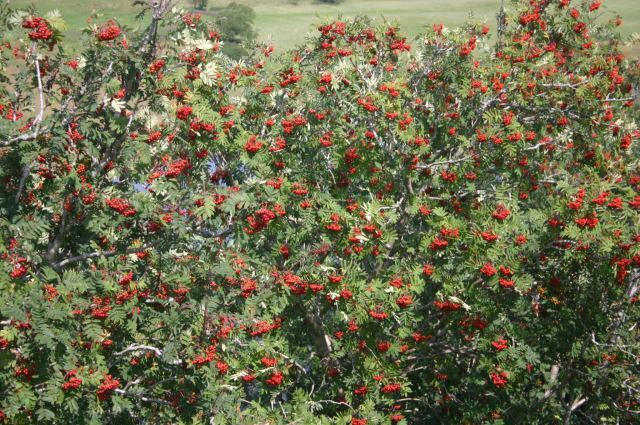 It was as if the countryside had unfolded beneath us and a welcome sign proclaimed that Heddon on the Wall our destination for the day was a mere half a mile away. An hour later we had secured ourselves a bed for the night at a hostel and were heading to the nearest pub having seen our first sight of the actual wall which made it all seem real to us at long last. Ten miles down already, we thought to ourselves as we went to sleep that night. All too soon the alarm clock blasted us into Tuesday and realisation dawned, we were going to have to do it again. For a change a clear blue sky accompanied us. Our goal for the day was a village called Wall, a mere fifteen miles away; already the wall seemed to beckon us on. By mid afternoon I could feel my feet starting to protest at all this prolonged activity so it was a very welcome sight when we found a bed for the night at the Hadrian Hotel. That night we slept the sleep of the dead in a large four-poster bed. Not even the discovery of a large blister on the sole of my foot could detract from the tremendous sense of achievement we felt . However we didn’t have long to contemplate our success before Wednesday dawned and it was time to go onwards again, this time to a village called Twice Brewed, a further twelve miles away. We had plenty of interest to spur us on as we were following a good section of the wall, which seemed to stretch for miles into the distance. It felt a little like being on top of the world with spectacular views all around. To the north you could indulge your imagination and picture raiding parties of Barbarians charging in. To the south there would be all the normal daily activity with local traders and supply columns arriving and departing. On the actual wall were the remains of mile castles or watchtowers at regular intervals so you could imagine Roman sentries on guard. 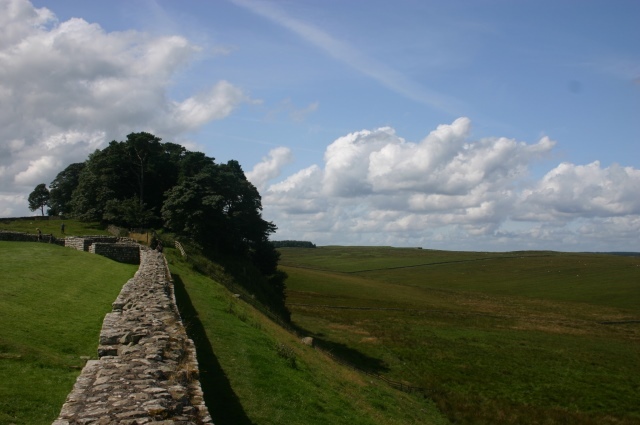 By mid afternoon we reached the remains of Housesteads Fort, which looked as if you could quite happily spend a day exploring it, but we didn’t dare linger for too long conscious of the fact we had to find a bed for the night. Our reward at the end of the day was a large glass of beer at an attractive pub in the village of Twice Brewed where not even the discovery of more blisters on my feet could dampen our spirits. Once again we were asleep the moment our heads touched the pillows and slept like babies until the alarm clock summoned us into the next day. 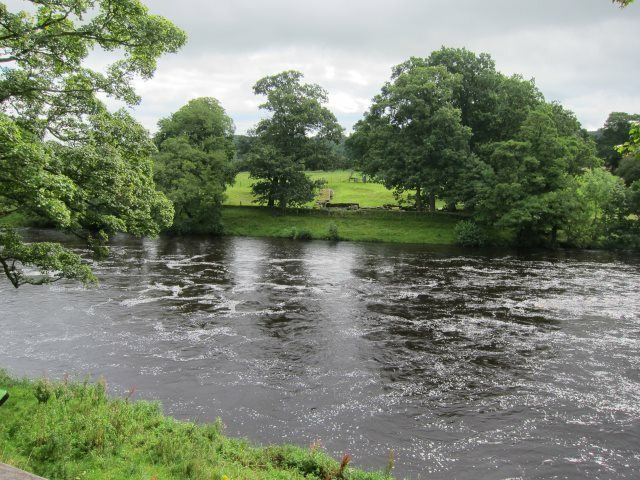 Our destination for the day was Gilsland, a mere ten miles away. Once again it was a clear bright windy day. By mid afternoon the countryside was beginning to level out, the wall was actually disappearing. We were beginning to feel like seasoned walkers by now and chatted quite happily to groups of walkers who had started from Solway. One group that did earn our admiration were three paratroopers who flashed past us going in the opposite direction in the afternoon, we were told that they were literally running the path and planned to complete it in twenty four hours. Joy of joys the wind seemed to have died down today and we were following an actual footpath now, the wall seemed to have petered out altogether as we headed towards Carlisle. Journeys end today was Irthington which was a little out of our way, about a mile off our path but it proved well worth the effort as we found a family run bed and breakfast where we were treated like royalty when we said we had walked from Newcastle. That night we sank into a soft feather bed, which needless to say bought instant oblivion. Day 6 brought the realisation that we were now on the opposite side of the country and nearing our destination, the only trace of the wall was now occasional earthworks. our route at one stage took us over the M6 motorway which made a change from being stuck in a traffic jam on it. When we reached our destination for the day of Burgh by Sands we found we had walked 16 miles. Our bed for the night was again a family run bed and breakfast. We felt somewhat bemused that we were a mere 8 miles from the end of our walk. The next morning we felt invincible as we headed out of the village to the Solway Firth. Again it was interesting walking with fishermen, boats and birds all around us. By 2 o’clock journeys end was in sight, I was ready for a brass band or equivalent feeling quite emotional but all there was, was a line and the words finish painted on it on the ground. We had made it and walked 79 miles in seven days, not bad for two people who hadn’t walked further than the local pub for years. Walkopedia says THANK YOU John. Very helpful.